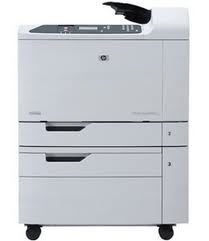 With the HP Color LaserJet CP6015x, you can get more done with fast print speeds for both black-and-white and color—up to 40 pages per minute. Multiple imaging modes and Image REt 4800 smoothly render complex imagery without sacrificing speed. With up to 1200 by 600 dpi, get exceptional line detail for cartography or CAD applications. Designed for easy installation. Reduce time refilling paper trays with the CP6015x' standard 2 500-sheet paper trays.